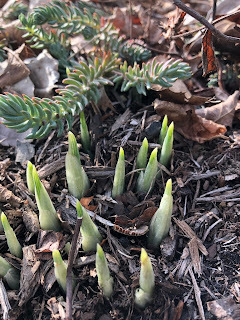 Welcome to Garden Bloggers' Bloom Day for January 2019. Blooms outside? Well, not where I can see them because we got our first major snowstorm of the winter season over the weekend and the garden is covered with over six inches of snow. 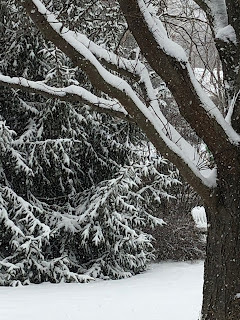 I could at this point get all philosophical about the beauty of snow, how it changes a landscape, how it invokes a winter interest that not all climates can have. Because it is beautiful, and it does change the landscape, and it does provide winter interest. It also covers the outdoor blooms! 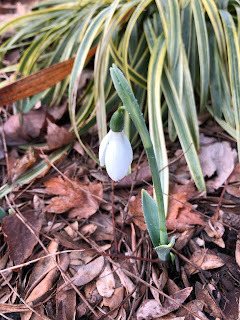 On January 2nd, I spied out the window a bright white object and ran out to find a single snowdrop in bloom. I assume I saw it from the window because the garden fairies put a spotlight on it and made it nearly impossible for me to miss. It's buried for now, along with these tips from Iris reticulata. I took this picture a few days before the big snowfall from Winter Storm Gia. They will be fine under the snow. They have no choice. They are rooted with no way to run away. Now I could run away, but I won't because just in time my Lily of the Valley pips have arrived from White Flower Farms. I'm going to pot them up and in a matter of weeks, I'll have a lovely pot of flowers like these from last year. Which is a good thing to have because they are already telling us that this coming weekend will bring another six inches of snow and it doesn't look like much of the first six inches will have melted by then. Such is the life of a four-seasons gardener! What's blooming in your garden on this fine January day? Join in for Garden Bloggers' Bloom Day and show us! It's easy to participate. Just post on your blog about what's blooming (or not blooming) in your garden on or around the 15th of the month. Then come back here and leave a comment to tell us what you have and a link in the Mr. Linky widget to tell us how to get there. No snow here so far, just fluctuating temperatures, your bulbs will be nice and cosy under their blanket of snow! So far we have been lucky and not had any snow but there is some forecast next week, I cant say I miss it. Snow is gorgeous, especially in other people's gardens. It was nice of the fairies to spotlight your snowdrop just before your big snow drop. We've had no snow here so far this year. Snow is a foreign concept here but it is indeed very pretty! We've got plenty of rain for a change, which is great - except for the mudslides threatening some of the recently burned areas. But rain doesn't cover up flowers, of which I have a relative plenty. Thanks for hosting, Carol. We’ve had no snow this year and I am so thankful! Hope yours is short lived. Your snow-covered garden looks beautiful Carol and I love your lone snowdrop. We just missed the snow as it was all around us, but because we are on the island, our temperatures stay a little milder. I love the four seasons and the first snow is always so beautiful. We are due for a possible round this coming Sunday, and time will tell. Happy Bloom Day! Before the snow last weekend, the pansy plants I planted in the fall were still blooming. They are all buried. I am still waiting for my amaryllis to bloom. I have three buds. I see so many bloggers grow snowdrops. I think my zone 8a gets too warm for them. At least that's what I read. Too bad, it would be nice to have something other than rosemary blooming! No sign of snowdrops here. One Christmas rose trying to bloom after Christmas. We're supposed to get a foot of snow this weekend so I don't expect to see a fully opened flower until mud season. But there's plenty of action inside! Two snowstorms in a row covered most of the flower possibilities, but I'm sure February will bring a real taste of the spring to come. 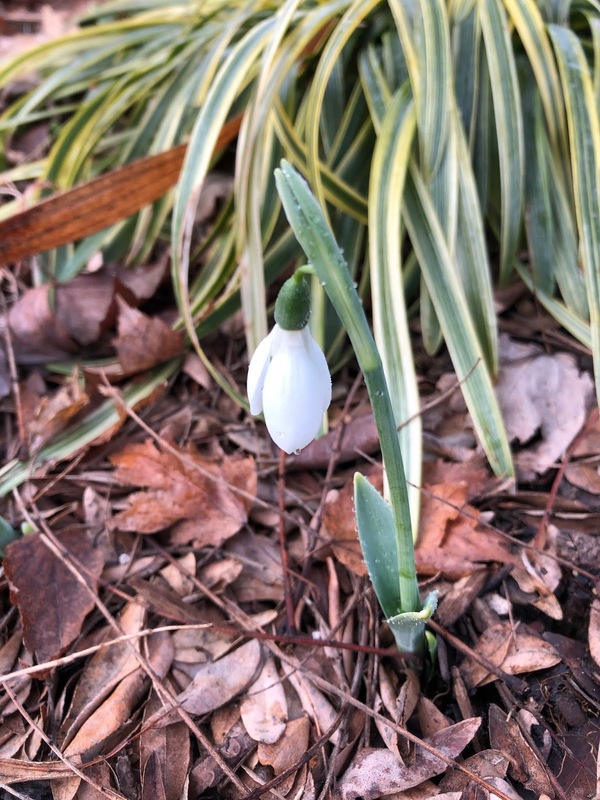 Carol, I'm amazed that you already had a snowdrop up before your snow. At this time of year, I thank the goddess for flowering house plants. You’re right, nothing is blooming in my garden right now except dreams of the 2019 season to come!